Spring 2017 sees the unveiling of an intriguing new twist in the story of Stella McCartney’s fragrance POP. 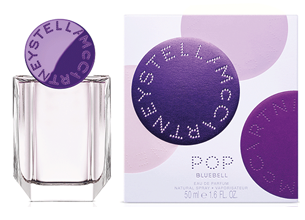 In POP Bluebell, the generation of pioneering young women she celebrated in the original scent take their journey deeper, darker, in a reflective mood, born of experience and their developing inner strength. They do so in a perfume with a deeper purpose: embracing sustainability, individuality, and a new kind of beauty. Known for its delicate, yet distinctive scent, English bluebell brings a new balance, depth and personality to the original POP’s tuberose and sandalwood. POP Bluebell tempers the bright, delicate, and dewy bloom of the bluebell with a deep and intriguingly sensual sandalwood base. Feminine without being fragile, bold yet balanced, it makes a statement without ever having to shout. POP Bluebell is about a mindset, a new sophistication embodied by a dynamic chorus of individuals.